You got yourself an electric guitar and a big dream to one day be the legend of rock or whatever genre you are into. You have saved up hundreds for your instrument that is pretty much equivalent to the best thing about your life right now, but there is no way getting around this – you need an amplifier. So if you are a beginner and cannot really afford an expensive amplifier, then you are in the right place. So what we will talk about is just a few of the best amplifiers that we deemed to be good enough for you. Apart from that, you will notice that most of these models are pretty darn cheap (compared to other more pro-level models) and, hopefully, that will be of some help too. Later on, I will talk a bit about what you should be looking for in an amplifier, what size you should get and what style because let me tell you, my friend, there are wayyy to many amplifiers to go through. So, let’s talk about some of the best beginner guitar amp that happen to also be some of the best amplifiers under $100. 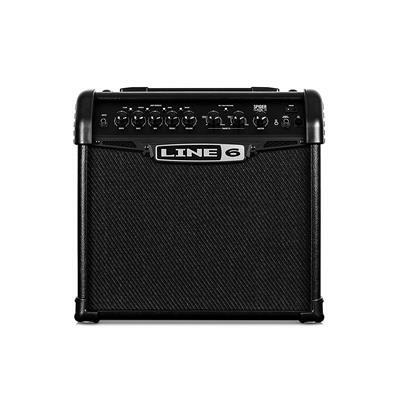 The first amplifier we will be talking about is Line 6 Spider Classic 15 Modeling Amplifier. I could not recommend a better modeling amplifier for a beginner than this one. It features some of the best and most standard rock tones and lets you manipulate the sound with as much ease as possible. The knobs are sturdy and easy to maneuver. This model also features effects like tremolo, delays, reverb and a lot more. This model is great for practice and your first steps into the world of electric guitars but apart from that, I would not recommend it for gigging or recording. However it is a very compact model you can carry around. While this specific model is 15 watt it is also available in 30, 60, 120 and 240 watts. For the price you will be paying the versatility and ease of use that this modeling amp delivers are beyond believable. Next model we will be talking about is also under $100 mark so it is very beginner friendly. Apart from that, I think anyone who is on a budget, even a more intermediate player would enjoy this model. 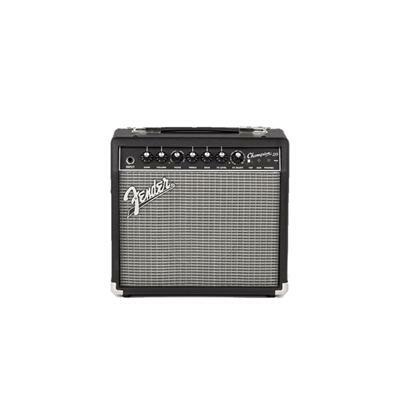 Fender Champion 20 amp has single 8″ Special Design speaker as well as single channel with selectable voicings. Some of the best effects on this model are reverb, tremolo, chorus, and vibratone. For an affordable model, this amplifier has quite a huge selection of controls including volume, gain, FX level, treble, bass and a lot more. This is a perfect beginner amp as it is very easy to master and produce great tone and has versatility. Just because of that this model can be used for pretty much any style starting from rock to jazz to metal. For such a compact instrument which you can carry around anywhere, it is surprisingly sturdy and durable. As much as you might want the best and the more expensive amplifier for your lovely guitar that you have been saving up for months, chances are you have a very strict budget that you cannot go over. In some cases a budget is good, it keeps you in check not to mention that high end, pricey equipment rarely gets you anywhere unless you practice a lot. 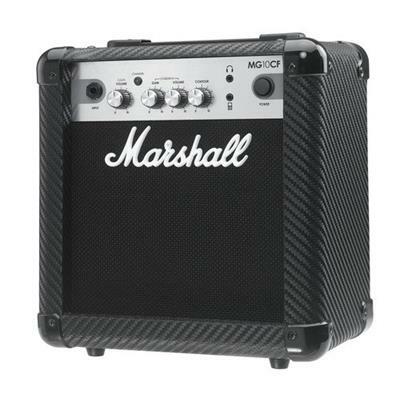 Just for that reason, I think, Marshall MG10CF MG Series 10-Watt Guitar Combo Amp is a great option for anyone on a very tight budget who wants a durable model they can use for hours of practice. 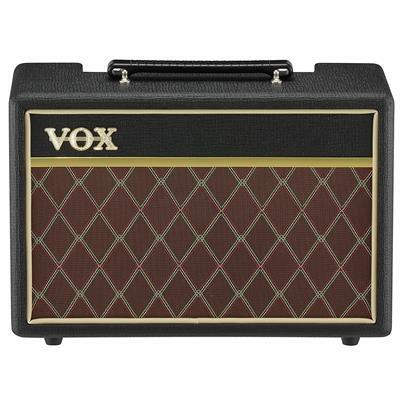 This is a 10-watt solid state model so while it does not offer the greatest volume it still kicks a punch. If you practice at home you can just use your headphones and not disturb anyone and have good control over the tone. While there are not as many controls on this model, you still get standard stuff which is sufficient enough for beginners. Size, durability, price and of course the sound are some of the major aspects of an amplifier. You might find a cheap amp that fits perfectly into your budget but it might not have the right sound. You might also find one that has great price and sound but the looks are just off-putting. VOX V9106 10W Pathfinder Combo in my opinion (and of many other’s opinions) has the best combination of sound, functionality, ease-of-use, and logos. With just 10 watts and 6.5″ speaker you would not expect the sound of this amplifier. It also features Volume, Gain, Bass and Treble controls which are pretty standard but work well and won’t cause any trouble. You also get control over the sound and switch from warm tone to crispy clean. This model is great for practicing and playing with your headphones so if you live in a small space than this might be an answer to all your troubles. This 12-watt amp with 8″ speaker might be a compact and lightweight model but it sure as hell delivers on not so tiny sound. 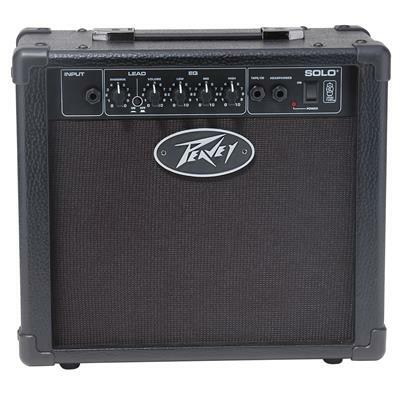 Peavey Solo 12W Transtube Electric Guitar Amplifier features TransTube tech which recreates the sound from tube amps and produces a dazzling sound that seems as authentic as from the real tube amps. While this model does not really boast a lot of effects like other models, it has great sound control and distortion effect that a lot of other models cannot achieve as well. Apart from that you also get three-band passive EQ that allows you even more control over the tone of your instrument. This Peavey amp also has a headphone jack that allows you to play without annoying any of your roommates or neighbors, as well as 1/4″ inch stereo CD input that lets you play along with other songs. 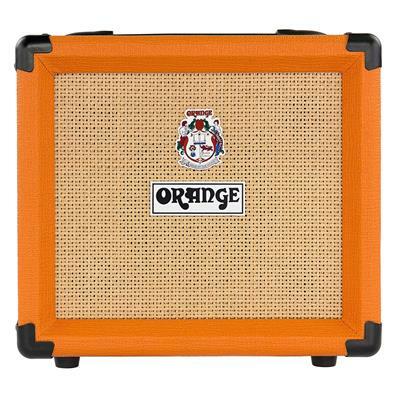 If you don’t want an old boring look of an amplifier that cannot be discerned from about a thousand other amps maybe check out Orange Crush Pix CR12L 1×6″ 12-Watt Combo which, unsurprisingly, is gorgeous orange color and basket weave Tolex. Fortunately, looks are not this models biggest advantage. This 12-watt combo amp has dual gain controls, 2 band EQ and master control that gives you full reign over the sound of your amp without making it over complicated. If you live with roommates or are just a considerate person who does not want people to listen to your practice for hours on end, this model also has a headphone output. So you can plug in your headphones and keep on jamming for hours and hours. While this model might not have as many controls as the first two models we discussed it still delivers on tone and has a really great volume for a 12-watt combo amplifier. Ibanez is a legendary name not only in guitars but in amplifiers and pretty much anything that decides to partake in. That is why we could not make this list without one of their amplifiers. 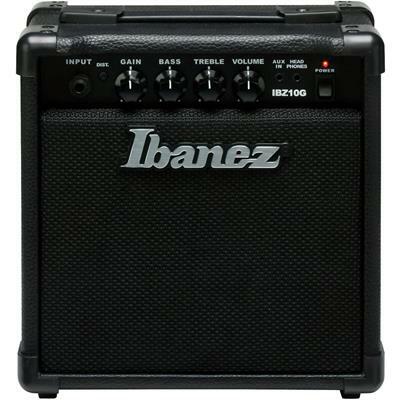 The Ibanez IBZ10G amp is a 10 watt, compact model with 6″ speakers that will be a great first amplifier for a beginner or an affordable and quality model for an intermediate player on a budget. Under $100 Ibanez offers an amp with EQ with Switchable gain and a headphone jack that can produce a clear tone and then more to overdriven without a lot of effort. While the volume might not be as amazing (I mean, it’s a 10-watt model, for crying out loud) it definitely sounds great and is easy to use if you are looking for something to practice with and have a bit of fun. If you are absolutely new to the world of amplifiers probably reading through the list we compiled was hopefully helpful. Nevertheless, you need to know a few details about amplifiers before being able to fully judge whether one of these models is a good fit for you. First, let’s talk about different styles of amplifiers. Another important factor you have to take into account is the purpose of your amplifier. There are amplifiers that are better for gigging and playing in front of a big audience, then there are the ones that are good for recording and finally, there are amplifiers that work the best for practice. Most probably if you are a beginner you will be doing a lot more of practicing than playing gigs so you need to look out for models like that. And, of course, we should talk a bit about different types of amplifiers. 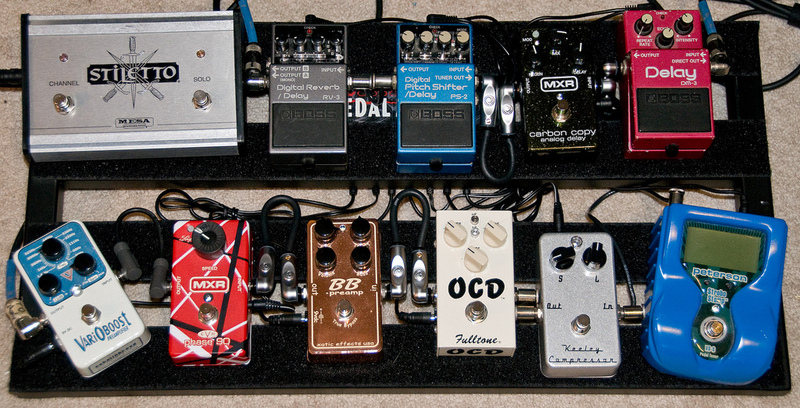 The three major ones are: solid, tube, hybrid, and digital amps. Solid tube amplifiers are the “working amps”. They are sturdy, durable and don’t need as much maintenance. They usually are cheaper than other alternatives and often preferred by beginners and intermediate players. They also produce cleaner sound but lack of natural distortion. The tube amps are a bit more expensive and favored by professional musicians who want natural distortion. They are also more pro-friendly because they are expensive and need more maintenance which is not the best option for someone who is on a budget. Then there are hybrids that use tubes along with solid state power sections. So they are basically providing best of the two worlds. Digital amps or modeling amps recreate the sound of the amplifier with software. They usually have a lot of different effects and versatility. If you have read a bit about acoustic and acoustic-electric guitars you know that tonewood is pretty much 50% of the quality of the sound (if not more). The same goes for amplifiers. The quality of the wood along with its thickness contribute to the final sound and tone of your amplifier. The thickness of the wood is vital not only for the reasons of durability but also because the sound will not be as “flimsy” and the amp won’t vibrate as much. When it comes to the size of your amplifier there is not a clear-cut answer. While some people might assume that bigger amplifiers have better sound and are more powerful, that is not always the case. You also need to consider your living and playing arrangements. For instance, if you live in a dorm room getting a humongous amp that pro-players gig with is… let’s just say your roommates and your wallet won’t be happy. It is also unnecessary, especially for a beginner. At the same time, if you aim high and want to gig at some point getting a 10-20 watt model that you can carry around with zero problems is not practical either. It also depends on what style of music you want to play and what tone you want to get. Sometimes, smaller amps will actually work better for your tone that 100-watt models that will take up your entire room. Finding an amplifier that is in your budget might seem (and probably is) tiresome. You look through dozens if not hundreds of models, browse through a couple of the best cheap guitar amp lists, compare one with the other and when you think you have found the right model another possible amp comes up and you start to hesitate. That’s a natural process and you will not regret taking your time, especially with affordable amplifiers. One thing to realize is that not all types of models in the same price range sound the same. You might think that you enjoy a tube amplifier but then realize that a solid state might be the way to go. What matters is that you know what sound you want to get out of your amp and be persistent about it. There are a lot of factors to keep in mind. Some of the major ones like the price, purpose, and size of the amp I have already mentioned but the world of amps is vast and scary (well… not that scary if you know a bit about it) and choosing the model that will fit your needs perfectly is almost as important as choosing your first guitar that will lead you to learning better and faster. I hope the list of the models here and some of the tips were helpful and you know a bit more about amps than you did before this article. We tried to include some of the best cheap guitar amplifiers and the best guitar amp under $100 but if you are looking for something more pricey we have a list of a lot of guides about amplifiers in most price ranges.